Alex Douglas earned his Juris Doctor degree from the Florida State University College of Law, where he graduated with honors in 1989. Alex holds a Bachelor of Arts degree with honors from Washington University in St. Louis, Missouri. Alex is admitted to The Florida Bar and is also admitted to practice in federal court before the U.S. District Court for the Middle District of Florida, the Southern District of Florida, and the Eleventh Circuit Court of Appeals. Alex handles only probate, trust, and guardianship litigation. Alex is rated by Martindale-Hubbell as an “AV” attorney, the highest rating. 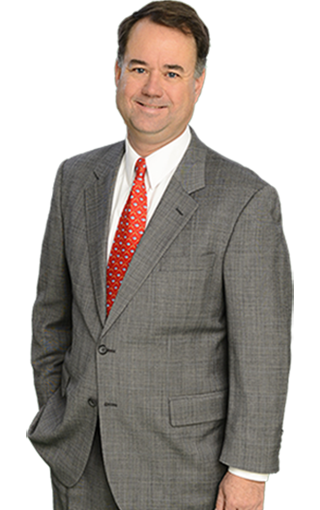 He has also been named a “Super Lawyer” by Thomson Reuters throughout the years and named to Florida Legal Elite. He actively speaks on probate, trust, and guardianship law and participates in The Florida Bar’s Real Property, Probate and Trust Law Section. He is also an active member of the Orange County Bar’s Estate, Trust and Guardianship Committee where he serves on the Steering Committee. Alex and his wife, Maureen, live in Maitland and are members of All Saints Episcopal Church in Winter Park. They have two sons, AJ (attending the U.S. Naval Academy) and Averey (senior at Bishop Moore) and one daughter, Grace (junior at Bishop Moore). Alex’s interests include boating, amateur radio, and camping with family. Member of the Probate Law and Procedure Committee of The Florida Bar’s Real Property, Probate and Trust Law Section; Member of the Orange County Bar Association; and Member, Central Florida Estate Planning Council; Member of the Probate Litigation Committee of the Florida Bar’s Real Property, Probate and Trust Law Section; Member of the 9th Judicial Circuit Grievance Committee.